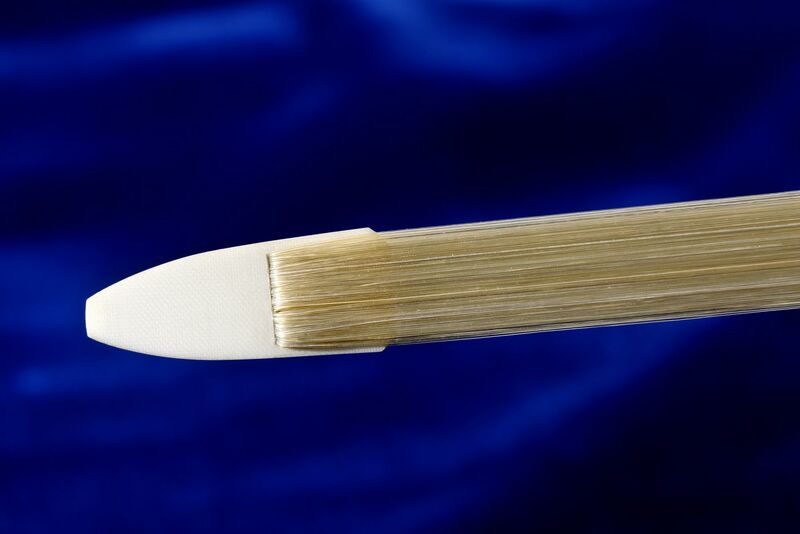 Our violin family bow horse hair is imported directly from China where the best bow hair originates. Our House Label Brand of hair, like our Select Mongolian hair is "Trusted Source" hair. We have developed strong working relationships with select suppliers of Chinese horse hair. Our suppliers are knowledgable of the quality of the hair needed for bow making and they work within our strict quality control standards. We extend a limited offering of quality hair. We do not offer a wide variety of varying grades as seen with other vendors where the customer is left with more questions than answers in what grade of hair to purchase. We offer our House Label Brand, Select Mongolian and Black Hair. 1) Select Mongolian - a very select grade of the finest Mongolian hair. 2) Black hair - our black hair is also the highest grade of hair available. The low price of the black is not a factor of its quality but rather black horse hair is more commonly seen in nature and so the price is low. For discerning players and for folks doing re-hairs this allows one to have the highest quality at a very low price. 3) Bowworks House Brand - this is a very good grade of hair for a reasonable price. Slightly more color drift, slightly coarser and a few curly hairs. Good quality for your serious players yet inexpensive enough for student and rental bows. Each bundle contains 1 pound of hair.